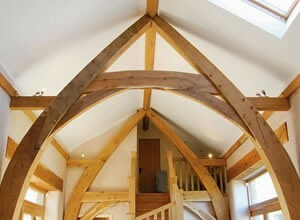 Hector and Cedric design and build Oak framed buildings, extensions and timber frame structures to the highest standard. We design and build all kinds of timber frame buildings, structures and roof trusses from modern conceptual designs to historical designs. Using traditional methods and techniques working with structural timbers we scribe and join them together using mortice and tenon joinery that is then pegged together to create the framework for our inspiring and unique Green Oak timber frame buildings. Not only do we work with Green Oak, we also use other native timbers such as Larch and Douglas fir. With this we produce: new build houses, timber frame buildings, roof trusses, extensions, conservatory’s, barns, garages, porches, garden buildings, and studios. We also take on restoration projects. We love our craft of timber framing and have a wide experience in different construction methods often combining them with steel and glass. Whatever you have in mind, if you are looking at your own project or you are a builder looking for some structural elements, we are here to guide you through the whole process from design, planning through to the finished project. We pride ourselves on delivering a great quality product within the project’s time frame and budget. We create bespoke furniture for inside and outside the home, usually working with timber from trees that have been felled and milled locally, such as Oak and Yew. Often we work with the natural grain, shapes and features of the timber to produce high quality and beautifully finished pieces to individual requirements. Popular items include chunky timber framed beds, dining tables and benches; for inspiration please browse through our furniture images. 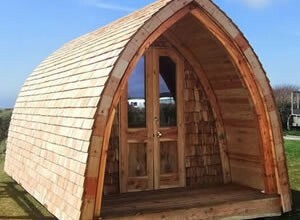 We use only wood and from sustainable sources and build using traditional and modern techniques to create inspiring and unique structures. 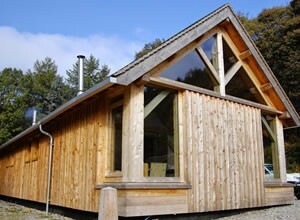 Using our system of modern eco construction methods, often combining this with structural elements of traditional timber frame carpentry we produce unique low impact, high performing and energy efficient bespoke – houses, extensions, and garden studios. We are serious about sustainability and the impact that construction has on our planet, using minimal petroleum based and low carbon footprint products, sourcing our timber as locally as possible and using natural and recycled insulation. We have worked on modern passive houses and straw bale buildings, our designs often produce modern, bright and warm spaces with the added charm of our unique, natural and contemporary timber features. Whether you have a firm vision in mind or need some help to develop your ideas, our creative team can work with you make it a reality. We are here to guide you through the whole process from planning, building regulations right through to the finished project. 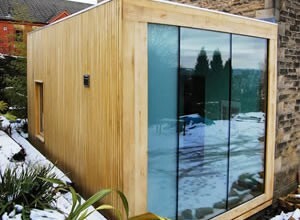 If you’re after a unique timber installation however large or small we welcome commissions. 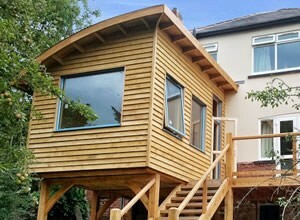 We can take your vision and bring it to life using our specialist carpentry techniques, we often like to combine timber elements with other materials such as steel to produce our stunning structures. 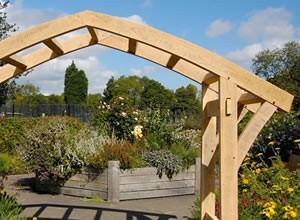 We have worked on various unique projects often working with landscape architects producing Seating, Shelters, Sculptural pieces, Boat structures through to oak framed bridges. Whether you need a wooden bench, a garden den or a complete wood framed building, give us a call to talk over what you need, or drop us an email.